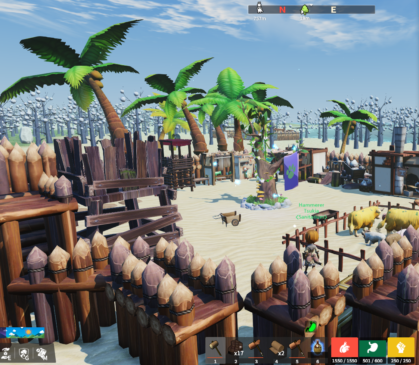 Tree of Life is a new sandbox survival type mmo where you find a home on a massive island shared by 3 factions that are at a constant conflict. You’ll see hundreds of bases made by other players and amazing landscapes that can only be seen in a cartoon styled world! The game features many things to do, but is absolutely not playable alone as you’re limited to a certain number of skill points and there are far more skills than those allow that are needed in every base. So then, lets dive off the deep end and into the Tree of Life review! 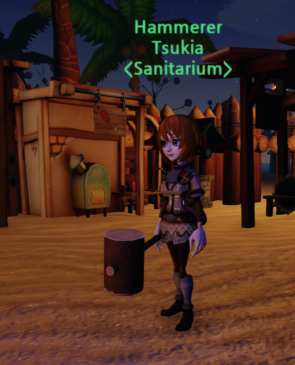 To start off, you choose you regional server (America, Europe, or Asia) and then you get the chance to create your character. While the process is extremely simple and you only have a few options, you can still make a unique looking character eventually. You can choose male or female as your character’s gender, which is a feature often lacking in survival games. Then you get to change your skin tone, hair style, and a couple other minor details. This essentially makes up the entire creation process, but it goes on from there. In Tree of Life, there are three factions that are locked in a 3 way conflict for an unknown reason. These factions are made up of hundreds of players active across all of them. First off we have the Adventurer Company, which is essentially the greedy merchants who have come to lay claim to the island for their own desires which no one really knows about. Next is the Bastards of Freedom, who have come to the island in search of redemption through the Tree of Life. And finally we have the Knights of the Roses. This faction has sworn to look for a cure for their Princess by obtaining it at the Tree of Life. Whether you want to be a noble knight protecting the people, a bandit stealing and raiding the people, or a greedy merchant supplying the equipment to do either, the faction you choose will determine starting location and that’s pretty much all it does. You can also venture out into the other factions territories but you will most likely not last long as players destroy anything not in their own faction if it’s in their territory. As mentioned before, this game is not solo friendly in the slightest. You are limited to 320 skill points in total. What this means, is that you can only level cap 6 total skills out of 20+. Each skill levels up based on the actions it allows. So for carpentry, building walls and furniture will level up the skill much like blacksmithing can be levelled up by forging weapons. With each skill relying on two other skills to craft items in that skillset, it leaves very little room to play solo so this game is highly guild oriented. There are two sets of skills, Living and Combat. The Living skills are essentially your crafting skills such as Carpentry, Logging, Mining, Blacksmithing, and Tailoring. The Combat skills are just that, the combat based skills. These cover your Armor skill, a skill for each Weapon type, and Healing, as well as Anatomy which determines how good of loot you get from each hunted creature. There are over 21 different ways to combine these skills to create the character you want to play how you want to play it. This creates conflicts however, for players like myself who tend to want to do everything. Being forced to join a guild to make up for the skills you can’t do yourself ruins the fun of the game for many, myself included. Regardless, there are thrills that are around every corner of every tree. Every skill is connected however, and sometimes in order to do one, you’ll have to learn three others. 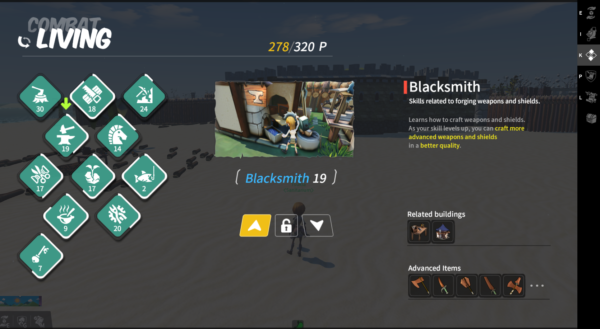 Take blacksmithing for example, you need not only Blacksmithing, but also Carpentry for the tool handles, and Tinkering for the grips, as well as Mining for the ores to make the ingots for each weapon. If you cap out Blacksmithing, you’ll also have to cap out the other three, leaving you with only enough points to cap your armor, main weapon, and possibly healing. This is why you can’t play this game solo into late game. At night, hordes of the undead spawn throughout the island creating a challenge for anyone who would dare travel at night, unless of course they just decide to outrun it….on foot….by moving at normal speed…Anyway, you’ll find challenging creatures who will actively hunt you, help their buddies, and even lure you into enemy players just to see what happens because you weren’t paying attention. These creatures aren’t all idiots afterall, but they don’t know how to knock down a wall, step over a tiny stake in the ground, or even go through wide gaps to enter someone’s base…okay, maybe they are idiots. If the creatures don’t get to you, the players who are always raiding will certainly try though as they usually have fast mounts capable of running down any player that doesn’t spend money to get one theirself. If you happen to fall victim to the above, you’ll have to run as a ghost very slowly to find a big green ghost called Mr. BoBoo in order to revive. Despite the AI being on the lower end, players often being jerks, and getting small glitches here and there, the game world itself is extremely nice and smooth. The biomes blend together perfectly, creating a sense of a realistic cartoony breathing world. Each area is unique and feels like it has it’s own natural habitat to it, whether it’s rocky mountains crawling with elk, or vast snowy plains with reindeer running around. As you venture from your starting “paradise” where all those afraid to be raided call home, you will discover the better places that are untouched by mankind and filled with natural beauty. Throughout the land, there are regions that are level based, allowing everyone to see what difficulty they should be in for their own playstyle. If you want an extreme challenge that will be nearly impossible until you’re in mithril armor, by all means set up camp in a lvl 40+ zone! Or you can stick with the newbies until you get a surplus of levels, gear, and food to make yourself a solid base in a more challenging area. 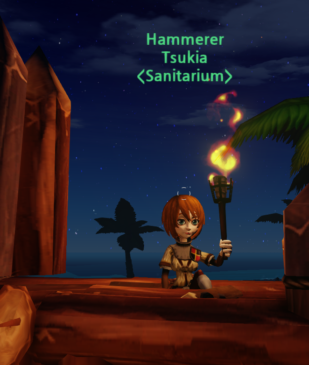 You can build anywhere you like throughout the island’s vast collection of landmarks, forests, ruins, and beaches. The best part is reaching the center of the island where the massive Tree of Life stands! This is where only the most skilled and brave can reach. It will be quite some time before it’s populated with a bunch of player bases. Exploration results in finding the perfect place for your base with the greatest view and defensive position! You just gotta look for it. 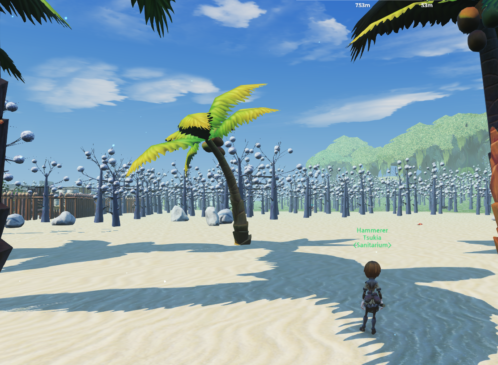 As with many sandbox games these days, Tree of Life has Taming as a feature. 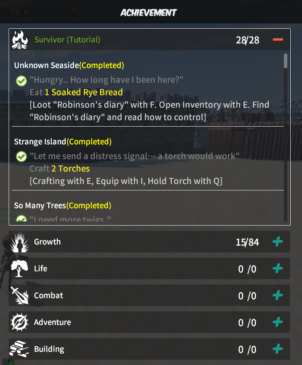 If you can master Ranching and obtain a good amount of pets, you can be the supplier of many of the islands rarest resources that are used by the other crafts. In order to be good at ranching, you’ll need farming to go with it. Each pet must be fed in order to produce special products that are specific to that pet. For example, feeding a ram Sheep feed, will result in it dropping lambswool, fleece, and occasionally poo which is needed for better farms. Feeding a chicken will give you feathers and eggs and so on. To start farming, you need a shovel to gather dirt and a well to gather water. Once you have enough of both materials, you can start making plots and planting seeds to make food for your pets. Early on, you won’t be able to make anything other than Hay from wheat, which isn’t directly feed for your pets. Once you’re high enough level, you can combine that Hay with Wheat to make chicken feed and as you get higher you’ll unlock more and more feed. Eventually, you’ll be able to breed your pets to make baby pets to further expand your resource producing empire. Breeding animals is a bit odd, since you have to make a “love potion” and combine it with the animal’s feed you want to breed. Keep in mind, one alone isn’t enough since it takes two to tangle. You have to make two of these each time you want to attempt breeding your pets. The next thing is to make them a pen so it’s easier to complete this process. The bad thing is, you can fail at feeding your pets….meaning you’ll lose the food or “breeding food” and all the materials used in making it. This can be extremely irritating at times since much of the process is a lot of work and waiting for crops to grow with small yields after. As with many games that only have one server per region, it gets very crowded very quick. This is why PvP, lockpicking, and raiding exists in Tree of Life. While you can’t openly kill players from your own faction or destroy their bases, you can lockpick their chests, crafting stations, and even their pets. This makes most players not trust the sight of others, even from the same faction. How PvP works, is that if a player attacks and kills another player from another faction, a Trace of Evil will drop. This item can then be picked up by the victim player and they can later place a bounty on the player who killed them. Bounty hunters will see the bounty (or might just attack them for being in their territory) and chase down that PvPer to claim the bounty. It’s a great way for those who don’t like PvP to remain behind friendly bases and keep themselves safe from harm. While it works in most cases, you will find some enemies banded together and raiding as a group, taking out many bases when they do. All factions do it, and all of them protect the victim bases because these players usually like open conflict with each other for entertainment. If you lockpick anything, it’ll also leave traces of evil, and you can get a bounty placed on you even by your own faction. You can’t however be killed by your faction’s members, so the bounty will only be claimable by enemy factions. So…in a sense….raid your allies before enemies if you want to get away with it! But no one likes a jerk, so it’s best to prolly not do that! Tree of Life is still fairly new, and after 2 years of development, it has come a long way. Each week they release a new update and perform server maintenance keeping a check on any new glitches that show up in the pipes of the game. The community is mostly nice and helpful, but the chat is quite toxic because of immature players with too much time on their hands. 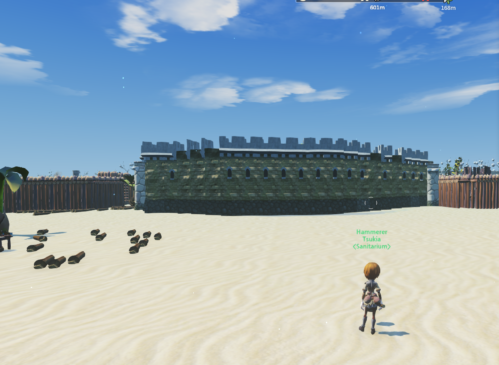 If you can look passed the chat and the cartoony graphics, you’ll find an enjoyable sandbox mmo where you can play with friends and build an amazing fortress together. A couple things to note is that each guild can only has one base, which means all their members have to live inside of that one base. This has led to hundreds of guilds made of 1-2 people scattered across the island. Each faction seems pretty close in power and player population, so it doesn’t really matter which side one goes with so long as they’re with friends or join others since doing anything alone in this game becomes impossible the further you get.